Unabridged Andra: Artist Interview: Esther from Once Upon a Bustle! Artist Interview: Esther from Once Upon a Bustle! Today is the first of my Artist Spotlights! I have found a few absolutely fantastic artists/jewelers/costume designers from around the web who all specialize in Steampunk fashion and accessories! I figured I would get an insiders perspective of these artists...what makes them tick so to speak, and what got them involved in Steampunk in the first place! So I am so excited to introduce you to Esther! She runs the site Once Upon a Bustle on Etsy. She is also an amazing artist/creator/designer/what-have-you of all things steampunk fashion! I am absolutely floored by how awesome her work is. 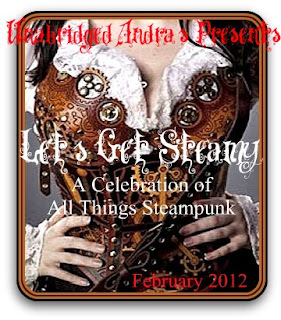 I have her here on the blog today talking about her pieces, her life, and the power of steampunk! If you guys are lucky (and you stick around until tomorrow) you will be able to win a CUSTOM MADE hat of her personal design! Hi Esther! Thanks so much for coming on the blog today! I am in total awe of your amazing ability to create amazing Steampunk pieces! I've seen your work, but now I wanna know a little about the woman behind the needle and thread! Tell me a little bit about yourself. My name is Esther Skandunas and I am a Theatrical Costume Designer. By day I am a Costume Shop Manager/Technician for one of the Community Colleges here in San Diego, CA. At night, I create custom handmade items for my Etsy shop “OnceUponABustle”. I began my professional career at the age of 17 by getting hired at the San Diego Old Globe Theatre as a seamstress…about two weeks after graduating high school! Prior to landing my first real job, I had been creating and sewing for the majority of my childhood. As I grew, my interest in clothing grew as well. I remember that all I could think about was clothes. In Junior high I began learning how to make clothes for myself. My mother and I would head to the fabric store and pick out some patterns and fabric…the first clothing item I made for myself was a pair of shorts made out of Holly Hobby fabric….I wore those shorts all of the time!! Wow! You have already done so much at such a young age! And I love that it's something that you can trace back. It kind of makes it...I don't know...Fate or something :) So how did you come across the quirky and odd genre of Steampunk? What was your first experience with it? Hmm…that is a tough question. I love history so much, and I especially LOVE the 1800s and the industrial revolution. The inventions, thoughts, the handcrafted items and the quality and details of those items are so inspiring. I am so in awe of that era….that diving into Steampunk was just the next natural step. My first true experience with the world of Steampunk was a few years ago. The college that I work for decided to put a Steampunk spin on the William Shakespeare’s play, “The Tempest”. That was the moment when I realized that this was it!! This is what I had been looking for. I needed Steampunk!! This is not an easy answer…My every thought has to do with Steampunk. All of my creations revolve around Steampunk and the Victorian Era….but yet if you were to see me walking on the street on an average day, you wouldn’t see a person that you would think “oh….wow, that person is so Steampunk!” I look like an average person. I probably look like someone that would not have a clue as to what Steampunk is …gosh…I hope that isn’t bad! I do, however, have my moments of obvious Steampunk-ism. I attend Steampunk events where I am completely punked out. I also am a Victorian reenactor to where I attend events in full Victorian Bustle dresses that I make for myself. My husband and his parents even get involved in these events. Ha! I feel the same way! I feel like people seeing me walk down the street would think I'm a dumb blonde/sorority girl type...little do they know I am obsessed with all things clockwork! Not to mention paranormal or anything mixing Steam and Supernatural! Let's just say people like us defy all known stereotypes and social boxes :) So...do you think Steampunk is here to stay or will fade away with time? Steampunk has been around for so long... I honestly do not think that it will fade with time. I think that it will actually get stronger. Sure, it may fade from what is thought of as the current trend in the general public’s point of view, but I honestly believe that the people that truly love, think and create Steampunk will never fade. Agreed. It's so different from so much out there that I feel like people just have to love the originality and creativity of it all! And speaking of creative...I want to know all about your work! Tell me a little bit about what you make...you know...what materials do you use in your jewelry, clothing, etc? What (other than the obvious) makes your work "Steampunk"? All of my items are one of a kind creations. I believe in the art of hand crafting. I believe in thinking about every little detail, every stitch, and every component to a piece. These are qualities that are not looked at anymore in our mass produced world of today. So though most of my creations may be obviously Steampunk to anyone that looks at them …it is the process that is not seen…the internal process that goes in to each of my items…that is where the true Steampunk aspect is. How long does it usually take to make a piece? I honestly can’t answer this question. Since each item I create is one of a kind, the time to create a piece varies from one item to the next. That's legit...I guess there's a wide variety between all that you do. You do clothing, jewelery, hats...I honestly can't get over the fact that you've made such wonderful things! So tell me...what's the best story you have about your work (an interesting client, some crazy-impossible piece that you finally finished, etc)? That is so exciting! I can't wait to see what more you can come up with and believe me, you will have an order from me in the near future. I'm attending the World Steam Expo in Dearborn in May and you are absolutely fantastic! Thanks again for coming on the blog! So everyone! Once again that was the amazing Esther! Do you see all the fantasm that she has created? How can you not want to win something custom made by a creative genius like her??? Well stop back tomorrow and you will be able to find out what amazement she will be making just for you! Thanks for stopping by and make sure to check out the rest of the Let's Get Steamy posts this week! Very cool. I don't have an artistic bone in my body but I love looking at other people's creations. I freaking love Etsy and frequently am looking for all things steampunk. I will be adding Esther and probably going to spend way too much money on her site. Great interview! I can't wait to see what other artists you have in store for us. Enjoyed the interview, And I`m on my way to check out Esther`s Etsy shop!!! What a talented gal. Her stuff is awesome! I am definitely heading over to Etsy to check her stuff out! WOW! A Theatrical Costume Designer! *_* I can't really sew, but I love sewing machines (my mother is a seamstress and my father sells and repairs sewing machines) and my favorite vintage sewing machine (among those I own) is a Dresdensia. Great interview! I love her products. Fantastic interview and the hats are really great. Just <3d your shop on Etsy and love what you do! wow! fantastic and so inspiring. WOW! Esther...these are so amazing! They must take ages to finish! I absolutely love that clockwork hairpin! I think I'll have to visit your shop when I get my paycheck and buy one!